Its come to my attention that we are having a bit of rice talk lately, so instead of having a bunch of different threads on the topic itd probably be smarter just to have one concentrated rice patty for all to enjoy. So hate it love it praise it or just plain laugh at it, if its rice and u wanna talk about it- it belongs in here. nice. maybe it would be worthwhile to merge the first page rice threads into this one? Great, this should keep the first page clean and the rice where everyone can "enjoy' it in one big helping. Already ahead of u just this computer is a bit slow- thing is the other rice threads are fairly specific in their topic and itd be a bit weird to mesh them all into one topic (and since it does it by the date of the psot, itd be chaos). Ill let the other ones hopefully die out. And hopefully people will start bringing their ricey questions and needs to here. Okay, when I saw this I had to post about it. Ap1 post MORE OFTEN! Need more of your avatar! those trucks are amazing, much better than those cars. I saw this Acord sedan on the way home, with fake vents in each door.. This fine specimen was up for a motorway drag race (with a rolling start speed approaching the cars limit). 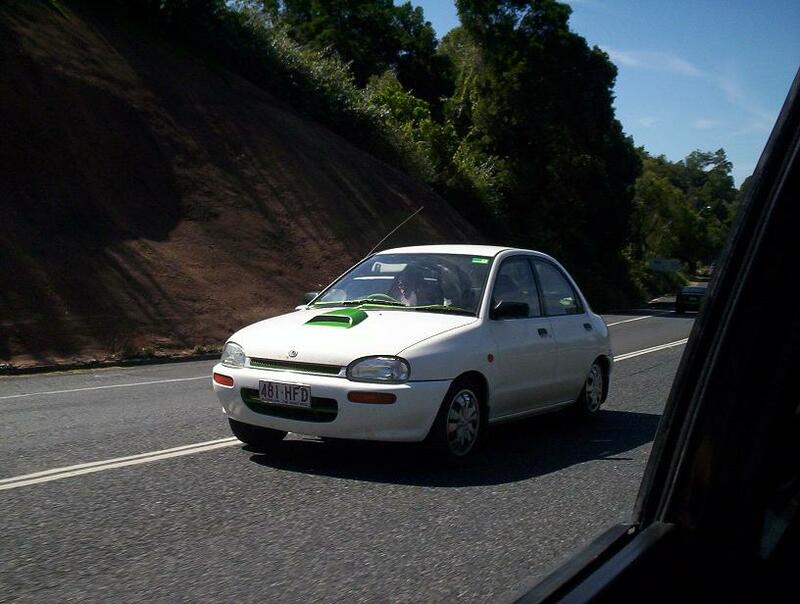 It was complete with green wiper blade, bonnet scoop, and front intake. It had chrome wheel-covers and a light in the exhaust tip that lit up when he hit the brakes (was too sunny to get a good photo). I f'n love those exterior mods on those cars. I saw a pic of one with a tail pipe that went about 6' up and bent into a star. I love those tailpipes. They're kinda like the ones on the old Beatle you see from time to time. ...except that the time it was mentioned above actually showed rice. The one you linked to isn't really rice, it's ingenuity. I mean, come on. A convertible DeLorean? A hovercraft? A 4X4? A limo? Those aren't rice... those are using DeLorean bodies that would've been scrapped for a more interesting purpose. I seen those trucks in live action GTO! But WTF is up with those platform bodykits or some crap? I liked the R32 and S14K's, but when i saw all the crap added onto the cars...that got me good. Also the HUGE spoilers and the HUGE mufflers. those were the best. The front bumper on that thing is liek whoa~!